Bingo Doc. I sat back and listened to all the million dollar coating guys. How dare you paint an AK.. 10 yr. old AKs. Beat, chemical cleaners, left out, looking new. 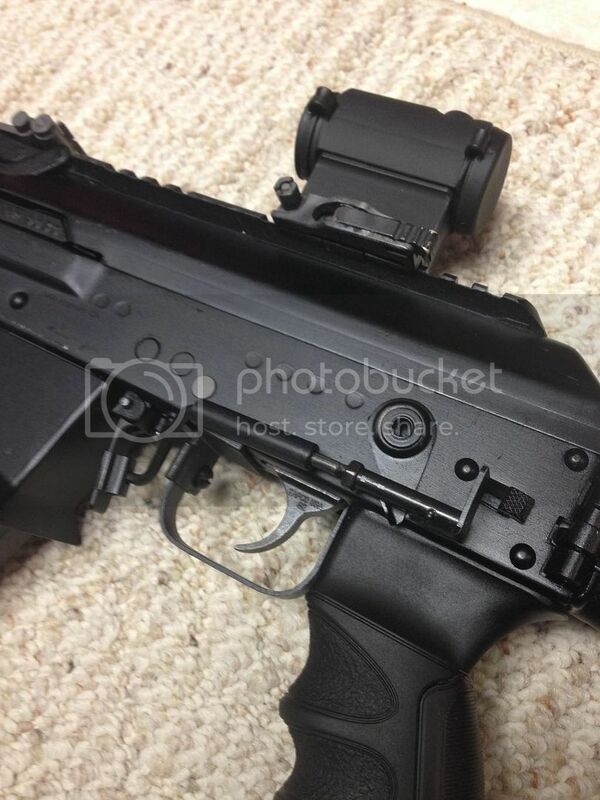 That is a factory competition thumb release that attaches to the factory long-tab magazine release. It is a bolt on piece with a little ball and socket joint between the armature and the piece attached to the magazine release. It takes some getting used to but it is a slick little add-on. Thanks Doc!!! That is an interesting piece. I might have to try and make me one of them, and try it out. I ordered a bulgarian bakelite upper handguard and received a sweet Romanian bakelite upper hand guard! SAR2 to AIMS74 #2 pics to follow. If there is any doubt, then there is no doubt. All said and done, it was ~$300 total since I already have a supply of necessary parts & tooling. This is a very nice looking ak. I am a toolmaker by trade would love to build an ak. I am very jealous of your skill. Do you fold your own recievers?